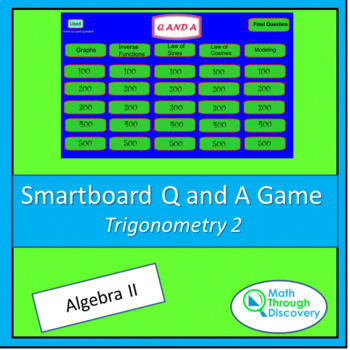 This Smart Notebook file contains 26 questions with solutions for Algebra II. The questions in each category are valued at 100, 200, 300, 400, and 500 points. •	Suppose a student selects “Inverse Functions” for 100. •	The student taps the value of the 100 and the question appears showing students a picture of a ladder leaning on a wall. It shows how far up the wall the top of the ladder reaches and that the base of the ladder is 3 feet from the wall. The question asks the students to find the angle on incline (which is angle B). •	Students could be given white boards to record their answer to the question. •	When every student has held up their white board and revealed their answer, someone could tap on “answer” to reveal the solution to the question that angle B is 60 degrees. •	To return to the Q and A Board someone should tap on “Back”. •	When you return to the game board, someone should move the “Used” marker to the last question. When all the questions have been chosen (all the questions have been labeled as Used) or the allotted time for the activity has been reached, it is time to choose the Final Question. Again students can make a wager just like they do on TV. It is time to tally up the points to see who has won. Any time there is a choice on the bottom of the screen to go “Back” you can tap “Back” to return to the Q and A board. 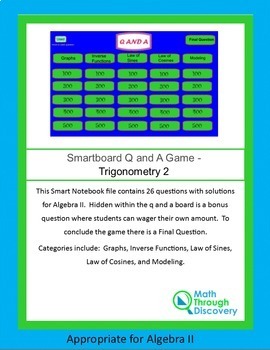 If you don’t own Smart Notebook Software, but you have a projection devise in your classroom you can use the web based version of Smart Notebook available at http://express.smarttech.com to run the Q and A game. Make sure you have Adobe Flash Player, run the Notebook Express. Open the Smart Notebook file and use the game as described above.